Cromwell was a small landowner from Cambridgeshire. In his 30s, he became committed to Puritanism. In 1640, he became a Member of Parliament, and supported those MPs who opposed the king. He joined Parliament’s side when the Civil War broke out. He was a good cavalry commander, although he was never in charge of the army. 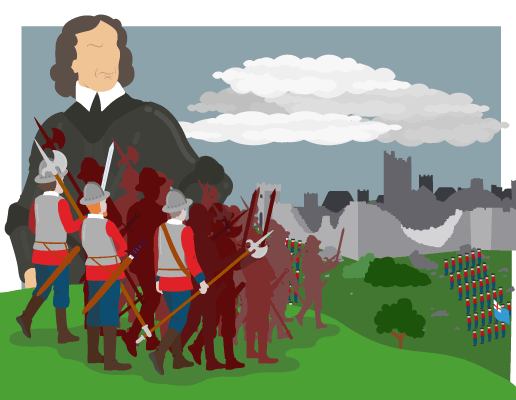 At the Battle of Marston Moor, Cromwell helped defeat the Royalist army by attacking them at tea-time. He was also criticised for recruiting men ‘of low birth’. As the war went on Cromwell became increasingly angry with the Parliamentary leaders. He accused them of not trying hard enough to defeat King Charles. The Self-Denying Ordinance – this made every man who was an MP resign from the army. This meant the army was independent of Parliament. 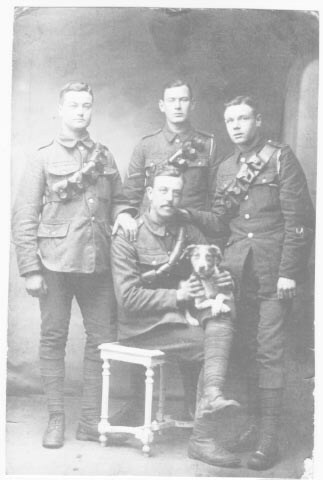 The creation of the ‘New Model Army’ – a well-trained, well-equipped, well-disciplined, well-organised army, with officers chosen for ability not social standing. It was politically open to new ideas and most soldiers were Puritans and so they supported Cromwell. After the New Model Army defeated Charles I, there were three powers in the country trying to negotiate the peace – the king, the Parliament and the army. Cromwell and his son-in-law Henry Ireton suggested a settlement called the Heads of the Proposals. When Charles I started the Second Civil War, Cromwell resolved to bring “that man of blood” to justice. He was one of the people who signed the warrant for Charles I’s execution. In 1649 Cromwell was put in charge of the armies sent to defeat Ireland and Scotland. There had been problems in Ireland since the Catholic Irish had rebelled and massacred Protestant settlers in 1641. About 4,000 Protestants had been killed, but Parliament put the figure nearer 200,000. So Cromwell – who thought Catholic beliefs were wrong – went to do a “great work against the barbarous and bloodthirsty Irish”. He captured Drogheda in September 1649. His troops massacred nearly 3,500 people, including 2,700 Royalist soldiers, all the men in the town with weapons and probably also some civilians, prisoners and priests. At the siege of Wexford in October 1649, 2,000 Irish soldiers and perhaps 1,500 civilians were killed. Slaughtering civilians as well as soldiers. Transporting many Irish Catholics as slaves to the West Indies. Giving Catholics’ land to Protestant settlers and exiling the Irish to poor land in Connacht in the west of Ireland. Cromwell ordered his men not to kill civilians and hanged those who did. Cromwell refused to show mercy to the people of Drogheda, as the laws of war allowed at the time, because they had refused to surrender. He wrote later that he gave the order only to stop bloodshed in the long run. There is little evidence that he ever sent slaves to the West Indies. Cromwell left Ireland two years before the Act for the Settlement of Ireland (1652) which confiscated Catholics’ lands. Cromwell returned from Ireland in May 1650. He defeated the Scots at the Battle of Dunbar (September 1650), and finally defeated the royalist army at the Battle of Worcester (September 1651). The Parliamentary army destroyed Dundee, killing 2000 of the inhabitants. They transported many Scottish prisoners as slaves to the West Indies. After the execution of Charles, England was ruled by a small group of MPs called ‘the Rump’. After three years, they had still not agreed to call a new Parliament. In April 1653, Cromwell and 40 musketeers marched into the Rump Parliament and closed it down. At first, Cromwell tried calling a Parliament, known as the ‘Barebones Parliament’, also known as the ‘Parliament of Saints’, but it was dissolved as some of its members were seen as too radical. 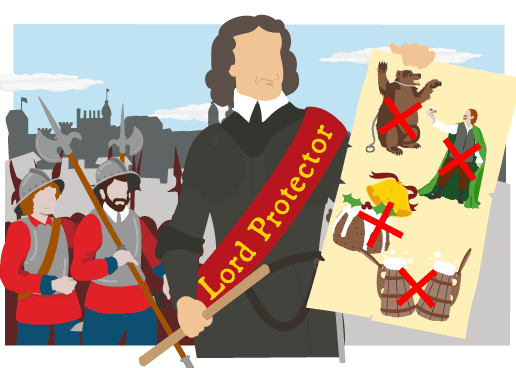 In December 1653, the army declared Cromwell ‘Lord Protector’, and gave him almost the powers of a king in 1657. Government: Cromwell dismissed both his Parliaments, which he regarded as too radical. He refused a petition to make himself king. Local government: He set up a system of ‘Major-Generals’, who ran the country as a military dictatorship until 1657. Religion: Parish priests had to be Puritans. He tried to allow people to believe what they wanted in their own homes with the exception of Catholics. He invited Jewish people to return to England. He is often described as a ‘killjoy’ because he passed laws forbidding dancing, Christmas and the theatre, but he also forbade bear-baiting and drunkenness. Foreign policy: He built up the navy, which defeated the Dutch. New World Colonies: He insisted that colonists were allowed religious freedom. Catholics could own land there. In 1655, the British navy captured Jamaica from the Spanish. Cromwell died in 1658 and within a year the Protectorate collapsed. In 1660 Charles was restored as king. Cromwell’s body was dug up and hanged. Destroyed the power of the king – for which he is sometimes called the ‘father of democracy’. Destroyed the royalist resistance and brought the Civil Wars to an end. Introduced Puritan religion and way of life to Britain. United the country in hatred of rule by the major-generals. Britain has since been hostile towards the possibility of a military dictatorship. Created a long-lasting hatred and resistance in Ireland. 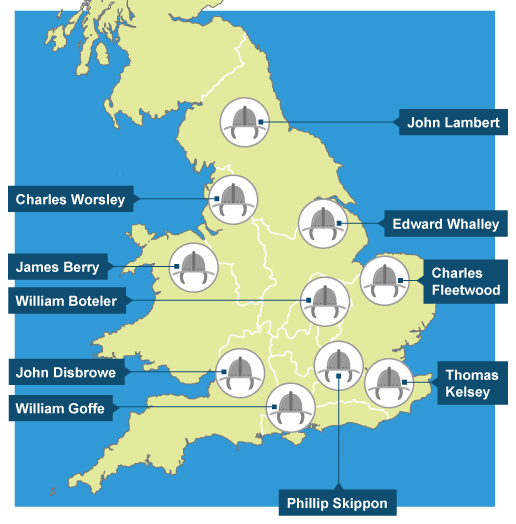 Built up the British navy – this was the start of England’s naval supremacy. Captured Jamaica from the Spanish – and thus began the British Empire. Allowed Jewish people to return to Britain. However, many of these consequences were temporary – the Restoration of Charles II saw the return of the monarchy, the Church of England and a freer way of life. Cromwell was a Puritan, who opposed the king in the Long Parliament of 1640. During the Civil War he fought for Parliament. He thought that Parliamentary leaders did not do enough to try to defeat Charles. Cromwell became the most powerful man in England, as the leader of the ‘New Model Army’. It consisted mainly of radical, Puritan soldiers. At the end of the first Civil War in 1646, Cromwell and the Army tried to negotiate peace with Charles I. In 1648 he betrayed them and started the Second Civil War and they resolved to ‘bring him to account’. Cromwell was one of those who tried Charles in 1649 and sentenced him to death. 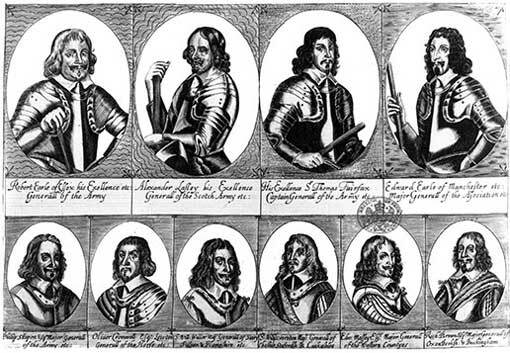 Parliament asked Cromwell to put down the remaining Royalist rebellions. He did this brutally, especially in Ireland and in particular at the siege of Drogheda in 1649. When Cromwell returned to Parliament, he found the ‘Rump’, the last few remaining MPs, of the Long Parliament still sitting. He closed Parliament by force. He attempted to create a ‘Parliament of Saints’ (1653), also known as ‘Barebones Parliament’, which failed. The army declared Cromwell ‘Lord Protector’ and he ruled England almost like a king, but he refused an offer to actually be made king. As Protector, Cromwell could not agree with his Parliaments and he dismissed them both. Instead, he ruled the country through his major-generals, which meant that England virtually became a military dictatorship. He allowed greater religious freedom for Protestants, but introduced a string of ‘moral’ laws which banned the theatre and bear-baiting, and forbade people to drink or celebrate Christmas, among other things. Cromwell increased the navy, which defeated the Dutch and captured Jamaica from the Spanish. When Cromwell died, the Protectorate collapsed and Charles II was restored as king.